Google News occasionally throws up some obscure postings that I would never otherwise come across. A recent example was a letter to an editor of a Scottish newspaper (not my usual reading material) declaring that “Climate change is not man-made”. The letter itself is uninteresting – a basic confusion between weather and climate seguing into a NIMBY-ish rant about windmills. Ho hum. The easiest way to look for this is to search for the exact string – specifically the second sentence. Google comes up with 1000 or so very close antecedents – particularly with the “new, modern, tide-gauges in 12 Pacific islands” section. The links are to comment threads on partisan websites, the standard climate ‘skeptic’ blogs, and even a mention on SkepticalScience. The comments stretch back around 5 years. Some of the examples give an actual source for the remarks (unlike Dr. Cameron’s version) – one Dr. Vincent Gray – a well known pseudo-skeptic. Some even cite the newspaper article they appeared in – a error-ridden puff piece by Lawrence Solomon at the Canadian Financial Post. Curiously, that online version of the article doesn’t have a publishing date – though secondary sources suggest it was published on Oct 26th 2007. The lack of a date means that people quoting it often claim that this is a ‘recent’ claim. 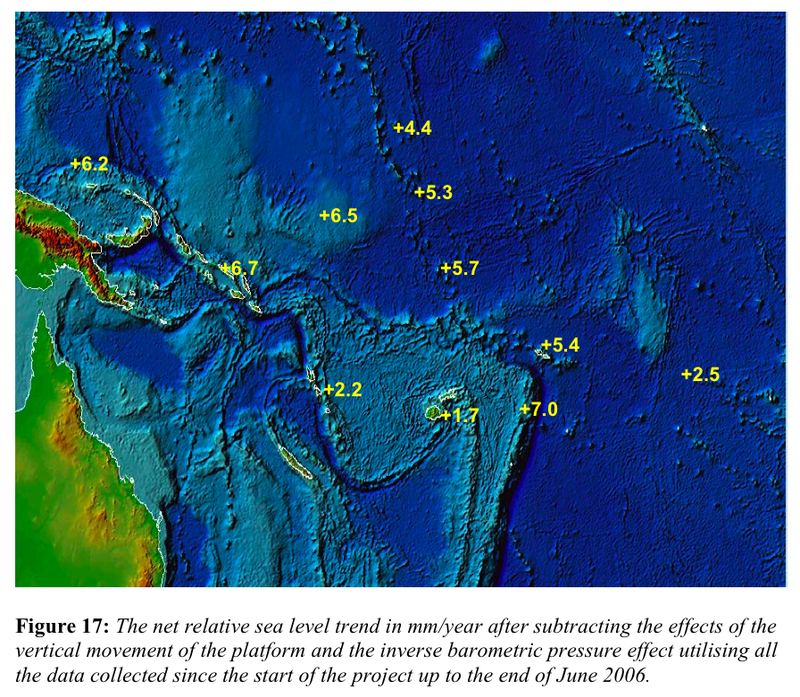 A claim that Pacific Islands were sinking led to an investigation by Flinders University, Adelaide, which replaced all the tide gauges in 12 Pacific islands to attempt to find out whether it was true. The attempt has now been abandoned as a failure, as none of the 12 islands showed any significant change since 1991. The team tried to save face by claiming that all showed an upwards “trend” because the 1998 hurricane caused a temporary depression in the ocean. Since 1998 all have remained flat, and the main island of contention, Tuvalu, actually rose last year. This is referenced to an actual report from the Australian Bureau of Meteorology about the “South Pacific Sea Level and Climate Monitoring Project” (SPSLCMP), dated November 2006. Now we are getting somewhere! There are some obvious signs of confusion in the Gray/Cameron statements. Firstly, the Australian National Tidal Facility (which installed and monitored the tide gauges starting in 1991) used to be managed by Flinders University in Adelaide – but the facility was transferred to the National Tidal Centre run by the Bureau of Meteorology … in 2003! Second, the SPSLCMP has been rolled out in stages starting in 1991: the third stage terminating in Dec 2005 – and they are now in stage IV. This might be the source of Gray’s claim that the project had been abandoned, though even the report he cited clearly states that the phase IV was started in January 2006 and was slated to continue at least another 5 years (at that time). The ‘last 16 years’ is a clue that the Cameron statement was obviously written in 2007 not 2012. Finally, annual reports from SPSLCMP are available through to June 2011 – indicating a project that is very much ongoing and one that was not ‘abandoned’ before 2007. So none of the statements that Gray (and Cameron) made about the project itself were true (either in 2007 or in 2012). But what about the sea level trends? This is even odder. The report Gray cites states clearly that relative sea level trends (1992/3/4 to 2006) at all stations were positive (2.7 to 8.1 mm/year for the 11 of the 12 stations with long enough records). The 12th station at FSM was only installed in 2001 and the trends were very noisy (though positive). The Jun 2006 SPSLCMP report goes further and applies corrections for platform movement and the inverted barometer effect, concluding that trends ranged from 1.7 to 7 mm/year at the 11 longer stations. Note that these trends may include a component of subsidence/uplift of the islands themselves and so are the numbers most relevant for local planning (not eustatic sea level change). But so much for not finding a trend! As one would expect, monitoring has continued since 2007, and in the latest report (June 2011), the 11-station trends range from 2.8 to 7.7 mm/year (and +17.0 mm/year at the FSM station). The monthly data series are available here for people to check for themselves. Comparisons with the satellite altimeter records show a reasonable coherence since the West Pacific sea level has risen faster than the global mean (at least partially related to the number of recent La Niña events). Trends using all data up to June 2011. Roughly comparable trends (1991-2012) using the satellite altimeter record. In summary, every piece of concrete information in the Gray/Cameron statement is wrong. They were wrong even in 2007 when the statement was written and even wronger when it was cut-and-pasted without sources in 2012. Yet demonstrating this took a a few hours of googling, a little familiarity with the issues and people, and obviously is not going to be done by every reader. Thus a statement which clearly make no sense goes unchallenged for years and keeps getting regurgitated. Sure, no single statement like this is likely going to change anyone’s mind about anything, but this one and others like it form part of a drumbeat of disinformation, which by repetition, becomes embedded and hard to shift. A good question would be why I bothered to research a claim in an obscure comment, on an obscure letter to the editor in a regional newspaper I have never read, and I don’t really have a good answer. Clearly, looking for substantive points in newspaper comment threads is a bit of a fool’s errand, but I was still surprised at how completely wrong every single aspect of the comment was. Given that I did look into it, it is worth sharing here – just on the off chance it will save someone else the bother. * The Golden Horseshoe award, whose name derives from the Hammett quote above, is for spectacular wrongness in the climate discussion, first initiated by SomeAreBoojums, and occasionally revived by the Wabett. Not only have you saved lots of someone elses the bother, you have shown a textbook case of how pseudo-scientizations get passed around and jam the actual signals that homo sapiens is capable of getting about climate. You have also made what should become a textbook case of how to deconstruct such scientizations. But there’s more–which you nailed, too. It’s a little like whiskey: if you know what you’re doing, you sniff it first. It helps to be a good sniffer. If you’ve smelled enough bad whiskey, you know the scent, and you get the drift. It is such a great scientific service that you dissect this deception. But given the enormous consequences of this deliberate misinformation – calling it a whopper of a golden horseshoe – well, it kind of discounts the harm it does, don’t you think? This deception promotes further delay in adaptation – causing real harm by sabotaging the future. This is a form of information treason that has been going on for decades. And even though it takes place in the common culture of newsmedia instead of academic journals still means that people will be harmed by bad information and opinion manipulation. Thank you for exposing this. But lets not underestimate the harm it does. Perhaps we need a site that goes beyond the ‘most common denialist claims’ so nicely debunked at Skeptical Science to include these kinds of finer grained fabrications? This kind of detective work is vital if climate scientists are to persuade the population enough to generate action. It’s high-gain political stuff, but probably low-gain for individual scientists. Political campaigns are constantly on the lookout for disinformation about candidates, and answer it quickly. In the realm of politics that strategy is necessary. There should be a letter to the editor refuting the false claim, not just here but in other journals publishing false claims. Also it would help if there is a central repository of specific false claims and authorative answers that people can use to refute the claims. This claim about sea level should not have persisted for 5 or 6 years without, I assume, challenge. A good friend of mine has lived on Tuvalu at Funafuti for the past four years. Prior to that he was stationed there nine years earlier. On his return he asked why they had moved the fence of his accommodation( pre-fab from Australia) closer to the lagoon, SLR was so obvious. Some parts of the island (coral) have been growing and to date have been keeping up with SLR,other places losing the fight. A Japanese team was there last year trying to reactivate coral growth in those areas. At the HAT the ocean now comes up through the coral and covers a lot of the island. Quite scary he tells me. A sinking feeling. Far from being limited to Calvinist divines like Dr. Cameron, the suspicion that climate change is both non-existent and an Act of God is embraced by certain members of The House Committee on Science. I go through this debunking process several times a week on a climate/energy message board at Investor Village. But I’m not as efficient at it as you. I have the RbutR button on my browser, but it never seems to help. This Skeptical Science post I wrote on sea level rise at Tuvalu is especially relevant too. There is a link to the South Pacific Sea Level and Climate Monitoring Project webpage near the end of the post. The most effective way to fight misinformation, ultimately, is to focus on people’s behaviors, Lewandowsky says. Changing behaviors will foster new attitudes and beliefs. Thanks, Gavin, for going to the trouble of writing this article. It raises the question of why so little effort, generally, is made by the scientific community to counter the misinformation, particularly on climate related issues, that appears in a constant stream in newspapers. Newspapers, after all, are the source of such information for most of the population, every one of whom has a vote. It is not as though there are not competent scientists, and indeed climatologists, in every region that could respond. Yet they rarely do, and so the tides of misinformation are rarely competently countered. Websites such as Realclimate and Sceptical Science provide a great service for those more deeply interested, but the great majority of the population never access them. It does appear to me that there is a need for the scientific community to become far more involved in countering misinformation in the popular press. It needs to become far better organised and co-ordinated so that the burden falls more evenly on more shoulders. Frankly, it is an indictment of the scientific community that Gavin, who already does more than his share on the Realclimate site, should feel the need to respond from across the pond to an article in a Scottish newspaper. Where are the Scottish climatologists, and why are they so silent? where serial dis-informer David Rose adds to his ever growing list of creative writings. Note how the sensible comment have been voted to the bottom by the pack dogs in this particular Magic Roundabout. The ever busy people at Skeptical Science have a more convincing rebuttal than that from the Met Office itself. Sounds like another myth to be catalogued at skepticalscience. I thought it has been established that the chief of the UN dept for Globalwarming had fiddle the statics to gain millions of dollars and rising of temperature at the moment is part of a natural cycle. Of course there is no such ‘chief’, and it goes on from there. It was a good educational opportunity. But it does illustrate pretty precisely Gavin’s description of the “drumbeat of disinformation.” Just last evening I was debunking, for about the three hundredth time, a repetition of the idea that MBH 98 was ‘discredited’ by Wegman. Thanks for this great piece of digging. Your efforts were not time wasted, but necessary to counter the concerted disinformation campaign by the deniers and skeptics who only need to sow doubt in the mind of the public about the scientific research on global warming. Referring to the source report http://www.bom.gov.au/pacificsealevel/presentations/briefing_paper_spslcmp_nov_2006.pdf it is interesting how looking at different pieces of information may serve different purposes. Yes, the first Table (Recent short-term sea level trends in the Project area based upon SEAFRAME data through September 2006) lists trends of 2.7 to 17 mm/yr. But quite close to it is a figura that shows that much of the variablity comes from early periods of measurements, and the trends seem to decrease with time. The paper warns about using the data. What is much more interesting is looking at Table 2 – historical data, where the trends are much smaller in absolute magnitude – despite longer observation periods, in almost all cases the standard deviation is larger than the trend and the mean trend of all data is 0.67 mm/yr – an order of magnitude smaller than the short term SEAFRAME data. So, how useful do you think Table 2 really is? Rebutting this stuff could easily be a full-time job and people believe what they want to believe. Just last week (at a discussion about the movie Fuel) I encountered someone who still believes the completely absurd claim that a Toyota Prius consumes more energy than the lifetime energy cost of a Hummer. That the story originated from a PR company that among other things assumed a Hummer lasts 3 times as long as a Prius has not penetrated public consciousness to the same extent as the original lie. Gavin, thanks for taking the time. Someone has to do it. I try as well, and anyone who takes the need for translating science to sensible policy should too. Even more interesting is the differences observed between sites. Since the turn of the century (when all sites have continuous data), the most western sites (FSM, PNG, and Solomons) show extremely high rises of 12, 14, and 18 mm/yr. The most eastern island (Cook) also shows a rather high increase of 10 mm/yr. 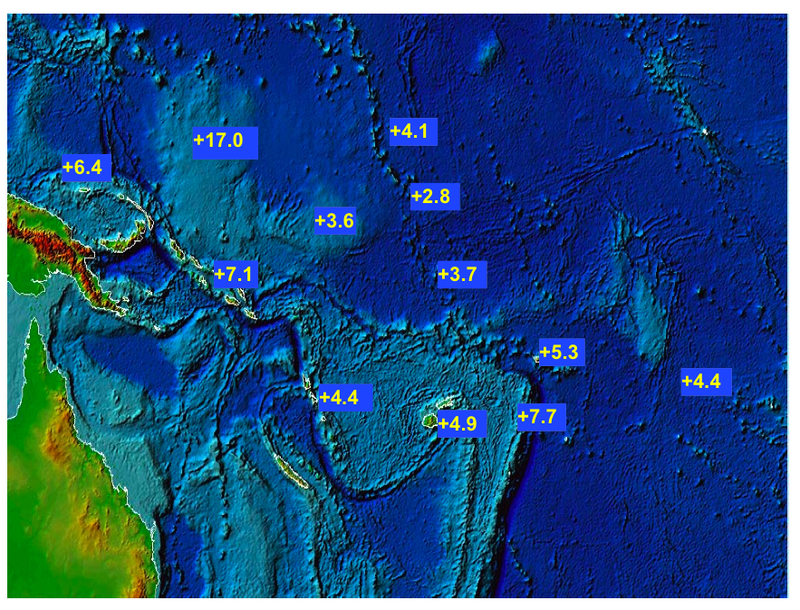 The three southern islands (Samoa, Tonga, and Vanuatu) show medium rises of between 4 and 5 mm/yr. The most northern island (Marshall) shows a medium increase also, 6 mm.yr. The three middle islands (Kiribati, Nauru, and Tuvalu) show no change or a decrease (0, -1, and -2 mm/yr). Several islands showed a large drop (0.5 m or more) from 1997 to 1998. For this reason, many of the S.D.s were higher than the trend. I have noticed that some denier claims seem to have no source whatsoever. There is a claim that CO2 did not initiate the end of “the ice age”. This is true (planetary orientation changes are viewed as the initiator) but misleading (greenhouse gases were a necessary driver of the overall warming trend). I have never found any source of this claim, much less a scientific source. Seems to have started like a rumor. The British Admiralty charts drawn 200-300 years ago provide a very clear picture of what has happened to sea levels. These charts were drawn to a very high level of precision, by sailors who’s lives depending upon their accuracy. These charts are still in use today, because they remain the single most accurate record of sea level on the planet. While they have datum corrections for latitude and longitude due to the introduction of GPS and more accurate clocks, they do not show a datum correction for global sea level rise. Given that sailor’s lives still depend on the accuracy of these charts, this suggests that sea level rise is not global, or it is cyclical on timescales measurable in 1 human lifetime. Over longer timescales of 200-300 years the evidence suggests that sea levels are static globally. You spent time researching this because for some reason you care about the truth, about reality. And all of us, sometimes, have to roll up our sleeves and clean the intellectual toilet without a brush, as it were, because otherwise these tangled, foul clots of falsehood never get challenged and there is no limit to how much (collectively) they can do. So — thank you. I sympathise with Gavin’s position and anyone else who has more pressing matters to attend to, but this kind of debunking is invaluable. In the mid 1990s websites and message boards sprung up doubting whether man had set foot on the lunar surface or not. It sounds silly now–and indeed it is–but the doubters gained enough momentum (in print and television) to influence public opinion. It was a real pleasure to witness Jay Windley and Philip Plait pick apart various myths and arguments, without ever losing their cool. It’s one of the reasons I enjoy visiting Sceptical Science and Peter Hadfield’s YouTube channel. Not solely because persuasive critiques give me a warm fuzzy feeling inside, but because of their obvious educational value. The most effective way to combat climate disinformation is through posts like this one. Crush them, under the weight of evidence, and pound them into dust. Over and over and over. Excellent description! It goes into my Well Said file. Dan H has just rediscovered that sea level rise is not uniform. 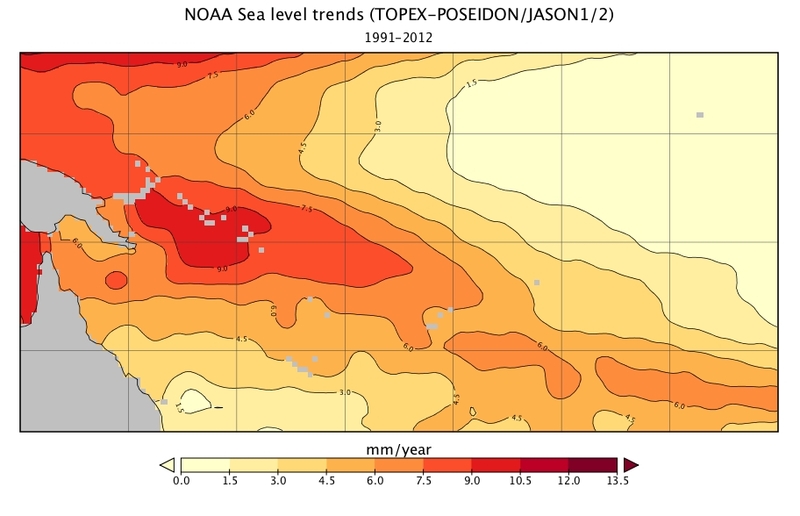 This is interesting but it of course is not a refutation that sea level is not rising. There are many things such as currents or also interesting is the movement of the solid earth. Policy and development planners need to focus more on relative sea level than the global mean. For instance the sinking of the land in New Orleans is occurring about 3 times as fast as the rise of the global sea level. This of course compounds the problem there. It is important to not let the interesting details obscure our vision of the broader picture which is that the global mean sea level has been and continues to rise. sorry for typos as I am on my phone. Not a wasted life.. I find the methodology of deconstruction of how myths get spread fascinating, if this myth make another cut&paste appearance I will know where to redirect it to. It actually makes for a good case to have a dedicated climate myth buster wiki. The latest skeptic ruse I have noticed and did a bit of background research concerned windturbines. JUDGE SAYS WINDTURBINES CAUSE PROPERTY DEPRECIATION, bad for health and terrible etc. Despite being posted now it turns out the court case was back before 2004 and concerned a house sale in 1998. It wasn’t actually to do with the turbines but simply because the sellers had lied to the new buyers that they hadn’t objected to them. A £15k award was made to the defendants. Not quite AGW but green energy and climate change are frequently mixed. You may just learn something from watching this: Jerry Mitrovica, Harvard University. Propagating this stuff is a full-time job for some individuals, and it’s a lot easier to make up nonsense for publication than it is to refute it. I think the best we can hope for is that alert members of the reality-based community will see it, and direct the honest-but-unconvinced to sites like this one and SkepticalScience. 1) there are limits on the amount of spare time scientists have to counter nonsene. 3) the amount of stupidity in newspaper letter writers is infinite, as you personally have seen. Since the current rate of sea level change is about 2 milifathoms a year, charts calibrated in fathoms fall about three orders of magnitude short of persuasive. Comics are often looking for material. The New Yorker highlights goofs in other publications, Dave Letterman often has a segment on stupid newspaper articles, and Craig Ferguson grabs stupidity from the internet. If it is topical, SNL Weekend Update or the pair of fake news shows on Comedy Central might go for it. Feeding this kind of thing to their writers might turn out to be useful. This particular story might work for Ferguson because he likes to play with a Scottish accent. So, one person could pass it along I guess. Someone could be researching how lies have spread, given the availability of timestamps and mapping software. Where’s the Journal of Internet Epidemiology? By analogy consider the research identifying which members of social networks are likely vectors for contagion. A few people who talk with or touch many others can keep an epidemic spreading that would die out in a more cautious or introverted community. This is one reason statisticians and epidemiologists are such a threat to business as usual. In the paper-print days, most people didn’t believe in risk studies showing externalized costs and collateral damage — because odds were nobody in their family, or on their street, or at their job had died of whatever the risk was. They hadn’t seen it so it didn’t happen. http://www.nickdiakopoulos.com/2012/06/12/fact-checking-at-scale/ has some good pointers on fact checking, for anyone looking for an honorable profession. Nice to see that you may be able to understand concepts like plate tectonics and uplift. Overall, the global sea level has been (and continues) to rise at ~ 2mm/yr, and some regional planners will have a more difficult time than others. If you two can’t agree, what hope is there? Let’s call it 3 microcables or 15 microfurlongs. Of course, no sources were cited for these “scientific facts.” Admittedly, I haven’t investigated to see if I could find the original source. I suspect these theories originated in a flash of inspiration during a late-night beer drinking session while watching pro-wrestling or a monster truck rally on cable TV. I am a physicist by education, and I have an ingrained aversion to trusting data where the effect signal/noise ratio is smaller than 1. Of course, there are circumstances when even high noise may allow digging the signal right. But in this case, as we consider multiple effects: local sea level changes, global sea level changes, island up/down movements vs crust – all of which seem to have comparable (within an order of magnitude) scale, determining what is signal and what is noise is much more debatable. When standard deviation comes from gaussian noise – the treatment is easy. But when it comes from nontrivial combination of various mechanisms … much care is required. True. But these historical gauges have much longer history and could not be *designed* to track long term sea level changes (especially AGW related) because this notion was not *fashionable* then. Still, in pure numerical terms they do provide significant data, and unless a good explanation for the differences between new/historical measurements is provided we are faced with a problem. Quite typical for science in general. What pushed me to write the comment was the selective use of observations to achieve a *nice picture*, that would be *well received* by the readers of the Realclimate web site. This is not science, this is propaganda. – clearly state our state if knowledge (or lack of it) in the meantime. Part of the problem is that people like Gray get by with such disinformation with impunity. Gavin’s careful research on this case could result in Gray paying some penalty for his dishonesty (or incompetence), which is so damaging. How about a carefully drafted addition to his Wiki entry? How about an article, like the one here, submitted to an appropriate publication? Scientists should not get by with ignoring scientific standards in the statements they make, just because the statement is not in a paper submitted for peer review. I know, tilting at (Dare I say it?) windmills. AJ #23: see #15 for pointers to rebuttals. Here is the URL for the Met Office response again for the lazy. The linked Skeptical Science article at #15 isn’t the actual debunk, so here it is. Summary: it’s the old going down the up escalator fallacy. I believe the major political parties employ people whose job is exactly that. It might be worth getting hold of contact details for those people, and making sure they’re thoroughly briefed on key elements of the evidence in climate science, and provided with access to the peer-reviewed literature. On the specifics: this story about tide gauges on Pacific islands, in one form or another, has a rather older provenance than 2007: for example, something similar appeared in the Daily Telegraph on 6th July 2000. The Telegraph did at least contrast the sea level fall at the tide gauge with remote sensing data showing general sea level rise, although it neglected to mention that the remote sensing studies relate to a broader spatial scale than the tide gauges. To how many leagues does that convert?